(5" h. x 9 3/4" w. x 7 3/4" d.). (6 1/4" h. x 6 1/4" w. x 10" d.). (9 1/4" h. x 7" w. x 8 1/4" d.). (7 1/2" h. x 6 3/4" w. x 7 3/4" d.). (4" h. x 6 1/4" w. x 6 1/2" d.). (5" h. x 7 1/2" w. x 5" d.). (6 1/2" h. x 4 1/2" w. x 6" d.). Two versions shown - exact design may vary. (3 1/2" h. x 4 1/4" w. x 4 1/2" d.). (4 1/4" h. x 3 1/4" w. x 5 1/2" d.). (9 1/2" h. x 9 1/2" w. x 9" d.). In March 2019 this piece is being offered for bids for the benefit of flood relief in Mozambique, Malawi and Mozambique. See here. This sculpture is based on a true story which took place during Mozambique's terrible floods of March, 2000. Much of the country was completely flooded, driving people to take refuge on rooftops and in trees. Sophia Tedro gave birth to her daughter Rosita while she was taking refuge in a tree. She and Rosita were rescued from the tree by a helicopter. 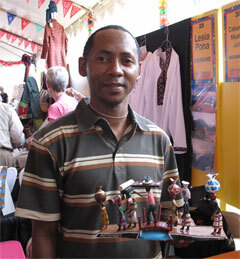 The story was published around the world, and has now entered into Mozambican folklore. See accompanying photos from the Guardian, UK. (15" h. x 12" w. x 10" d.). (7 1/2" h. x 12 1/2" w. x 7 1/2" d.). (5 1/2" h. x 7 1/2" w. x 7 3/4" d.). (11" h. x 9 3/4" w. x 8 3/4" d.). (5 1/4" h. x 6 1/2" w. x 5 1/2" d.). (5 3/4" h. x 12 1/4" w. x 3 1/4" d.). (4" h. x 4 3/4" w. x 3 1/2" d.). The trademark folk art form of Santo Damásio in Mozambique is Psikelekedana, a type of softwood carving made from the wood of the cashew nut tree. Dino (Camordino Mustafá Jetha) began to learn to carve at the age of 18 from an elderly neighbor who was a master of the craft. Dino learned to join the figures to a base in order to create scenes of daily life, and customs and traditions such as weddings, and Chiguiana, the after-wedding ceremony for receiving gifts. 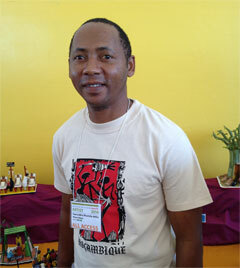 He received further training from Aid to Artisans and has participated in exhibitions in Maputo as well as participating in the National Fair organized by Centro de Estudos e Desenvolvimento de Artesanato (CEDARTE). 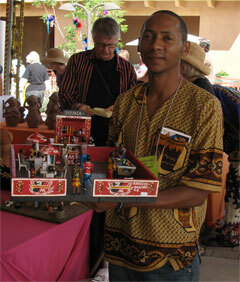 (Notes courtesy of Santa Fe International Folk Art Market).